This deo-spray is a perfect all time wear for all the rough men. It drives away the foul body odor, refreshing you. This deodorant protects you from odor causing germs. This aromatic flavor invigorates your senses making you mesmerized. Additional Information: Denver offers a range of wide products like deodorants, perfumes, haircare and skin care, which are specially designed for men giving them a lasting redolence and replenishing sense of purification and liveliness. 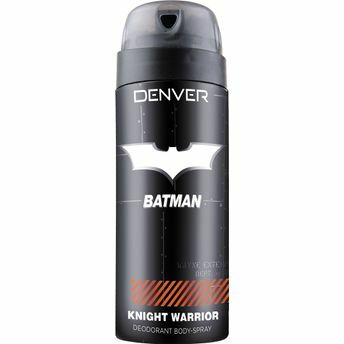 Denver Batman Knight Warrior Deodorant exuberates a magnetic scent that captivates all the senses giving you a remarkable confidence.